Peter Mountain. © 2014 Disney Enterprises, Inc. All Rights Reserved. What makes a great movie musical? A top-notch book and songs, competent cast, good production value and above all, only deviations from the original show when necessary for improving it for the screen. Into the Woods delivers on all counts. Stepen Sondheim’s fairy tale classic is imagined expertly by director Rob Marshall, who clearly loves musical theater and isn’t interested in fixing what ain’t broke. The songs pop off the screen. Though all-star casts often sacrifice musical talent for big names and pretty faces, here each character is well-cast and his or her singing ability holds up to Sondheim’s notoriously challenging score. Meryl Streep chews plenty of scenery as the Witch and even magaes a glamorous makeover that should make her die-hard fans and theater queens very happy. Johnny Depp’s all-to-brief appearance as the Wolf positively drips with amusingly creepy glee. And Anna Kendrick, Eily Blunt, James Corden and the other players each deliver lovely performances that never upstage the others but complement each other’s individual stories. The movie falters a little in the third act as the characters branch off from the mission that united them in the first place, and it never reaches the near-perfect every and verve of Marshall’s Chicago. But it is tiht when the storytelling calls for brevity, lush and sweeping for classic numbers like “I Wish” and “No One is Alone” and thankfully easy on the computer-generated effects to create its storybook landscape. 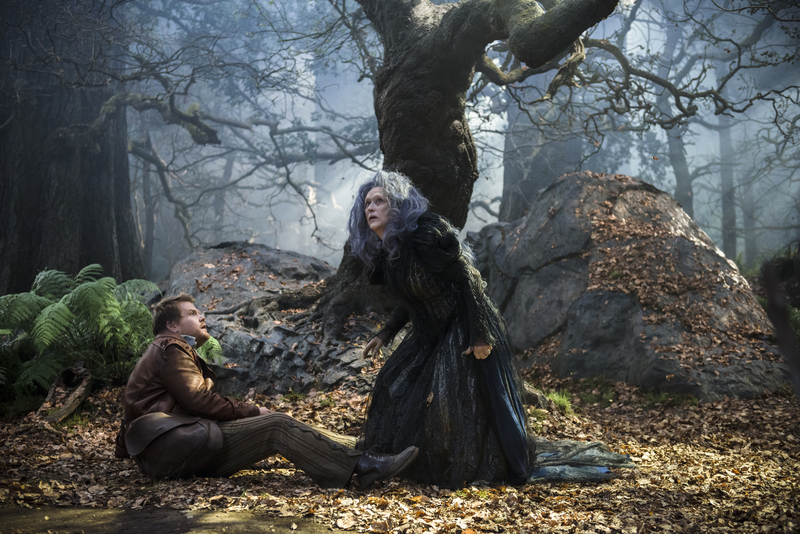 Into the Woods is challenging material and it’s tough to produce a movie musical to please both the fans and first-timers, but Marshall and company make it look easy.